Drake's new album Scorpion was the most listened to album of 2018. It may or may not surprise you to find out that Drake's Scorpion was the top album of 2018. It had the most sales and streams combined. The album is on track to hit over 3.7 million units beating The Greatest Showman, Eminem, and Post Malone. The album topped Apple Music which has an estimated 50 million subscribers and Spotify which has over 190 million monthly users. It was marketed on Spotify so much that some people complained about drowning in it's ads. And even in December it was still in the top 10 albums after being released in June. Streams really led Scorpion to No.1. Without streaming it might have barely made the top 10 albums. The Greatest Showman sold over four times as many physical copies (over one million copies) that left Scorpion in the dust. But Scorpion was streamed over four times as much at over four million streams bringing The Greatest Showman to it's knees with only one million streams. Add almost 3 million digital tracks sold which is almost double that of The Greatest Showman and you get the No.1 album. This really shows the power of streaming in today's era. Nothing could really compare to Scorpion. Post Malone's Beerbongs & Bentleys is well behind in second place at three million units, The Greatest Showman is even further behind in third place at a little over two million units. And then nearby you have Cardi B's Invasion of Privacy and Travis Scott's Astroworld taking fourth and fifth place, respectively. 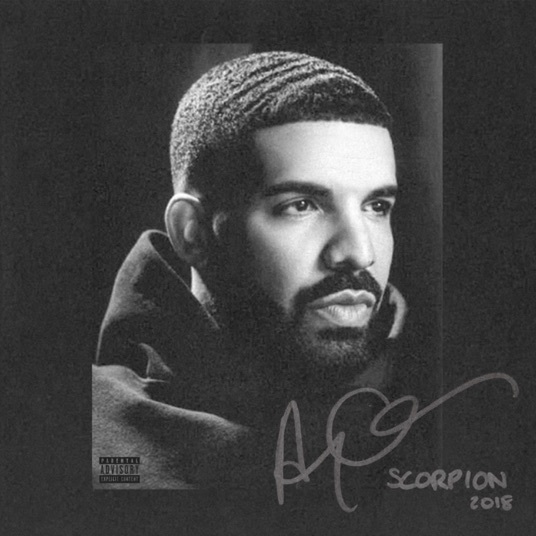 Scorpion was met with mixed reviews on Trackwave with 43% of critics liking it on over 50 reviews. Many were not impressed with how similar it was to some of his other material, that it was too big of an album, and that there wasn't much new. Others liked the hits that could be found on it and the revealing parts. Rap took over 2018. Of the top 10 albums, eight of them were rap albums. Counting streams has put rap albums up there and rap listeners seem to play the same songs repeatedly from their favourite artists. The only non rap albums were The Greatest Showman and Ed Sheeran's Divide which is saying something.